Winston is a Cavalier King Charles Spaniel. He’s three and a half years old, and he’s my constant companion. He comes to work with me every day. He sleeps in his bed on the floor next to me (he got kicked out of our bed for excessive snoring and unrepentant bedhogging). He sits on my lap when I’m watching TV and dozes half a dozen feet away when I’m writing or sewing. I was a cat person all my life. I liked dogs just fine, but cats were, if you’ll excuse the expression, the cat’s pajamas. Unfortunately, when I left home for college, my feline immunities collapsed under the weight of a latent allergy. Since then, I still love cats, but I have to love them from a distance. 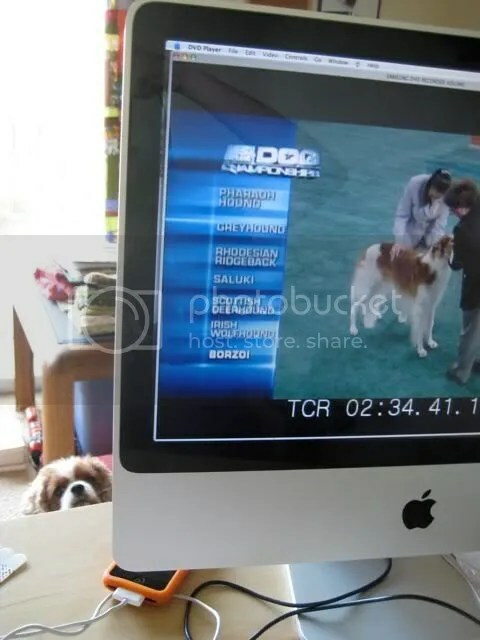 Four years ago, I got a short-term production on a travel show, which led to a short term job on a dog show. That turned into a staff position, and that meant I immersed myself in the world of dogs — their history, their psychology, their behavior, their communication. And I’m a research geek. When I get my research on, it’s on. I can name all of the 170+ AKC-registered breeds from memory. I can tell you why farmers bobbed the tails of their Old English Sheepdogs* and what is the maximum allowable weight for a Pekingese in the show ring**. So when I decided to actually get a dog for myself, it follows that (naturally!) I’d know enough about dogs that my dog would be the shining epitome of a well-behaved dog. My dog would make Lassie look like a slouch. He could do it right the first time. He just doesn’t want to. At work, he somehow learned the command, “Go say hi.” It means, “get up from where you are and go to the nearest doorway to let someone give you a tummy rub.” You can say “go say hi” anywhere, any time, and he’s off looking for the doorway. No spinning, no whining, no barking, no stink-eye. And living with Winston has taught us, too. We now have our own vocabulary. We have learned, for instance, the concept of being “tuck.” Being tuck is a lot like being stuck, except you aren’t actually stuck. Winston gets tuck all the time, mostly on rolling chairs with spinning seats. He loves jumping onto them, because so much exotic food lives on desks. But getting down again is a different story. He’ll sit on a chair and bark for ten minutes, tuck as tuck can be. The only magical way for him to get un-tuck is for me to appear somewhere in visual range — I could be fifty feet away. At that point, the “fasten seatbelt” light in his brain clicks off and it’s safe to exit the chair. I could go on forever. I love animals in general, dogs in particular, and Winston in a way that most people think is slightly unnatural. But I don’t care. All I know is that I’m never home alone. I always have someone to talk to. And if I’m sad, there’s always somebody around to lick the tears off my face (for some reason my husband hasn’t volunteered for the job). PS – Speaking of dogs, here’s a little video about a famous dog or two. Winston sounds like a character, Katie. They say pet owners are healthier then people who don’t have pets, and it’s totally clear why to anyone who lives with an animal. Pets comfort us, snuggle with us, and always want to be with us. If only people could be so cooperative! I have a question for you Katie: Why, oh why, do those dog show judges have to constantly keep… tugging on their little,uh, kind of pulling and rearranging their… “parts” while those poor little guys stand there on that podium thingy? If I ever had a dog it would be a Pug or Jack-Russel, if those are the appropriate names. But right now I’m content with being a cat-person. Don’t hate me…. Tell me you’ve seen “Best in Show.” Have we had that conversation before? Meredith, exactly! If I’m stressed, I know that within sixty seconds, Winston can have me laughing. That definitely can’t be said about some humans. And now for the long reply… Jason, that’s a pretty common question. The purpose of dog shows is to evaluate breeding stock–having good, consistent dogs could mean the difference between eating well and starving for anyone who relied on them–ranchers, hunters, farmers, etc. There are still a lot of real working dogs out there, and you’ll see many of them in the show ring. The judges have to make sure they’re intact, because there’s basically no point in judging a dog who can’t breed (farmers needed to know who had the best sheepdog that they could get baby sheepdogs from, not which sheepdog would have been the best but can’t breed). The exceptions are performance events like agility, hunting trials, herding trials, obedience, rally, etc., fun matches, and a special designation called the veterans class–which is basically a chance to get out and show people what a good dog looks like. In some of the rarer breeds, having neutered veterans compete (to win “best of veterans”–if they’re neutered they can’t go Best of Breed) is very valuable for new breeders. A few shows ago, we featured a great bloodhound who was a working search and rescue dog, but had to be neutered to work efficiently. He came and competed in the veterans class and gave everyone a chance to see how a bloodhound should be built to be successful on the job. yup, winston is on comical fella, bravo! Imagine, a latent cat allergy led you to a fascinating job — where there can’t be a dull moment — and Winston! How lucky are you, Katie? But do tell, research geek, what made you choose this very fine (adorable) fellow? Having recently lost my furry writing companion I loved this post. I also laughed as we also have our own special dog vocabulary. Okay now, be honest, how many times have you seen “Best In Show”? Of course you’ve seen “Best in Show!” I love the Weimeraner couple. They slay me every time. You sound a lot like us. We have one that sleeps between my husband and me, one that sleeps in the closet and one that sleeps on a heated pad in the living room. All-in-all, we’re a tight pack and have loads of fun together.They’re all rescue dogs that rescued us right back. I think Winston and I should have costumes made for each other, and operate like a super hero-duo. But rather than saving lives and catching bad guys, our mission is to do nothing but mischief: tie shoe laces together; prank calls; get on the elevator, hit all the buttons, then step off; shake a can of soda then offer it to someone; t.p. a house. Larramie, you’re right about my job. It’s always a good time. And, oh, choosing Winston. A co-worker had a Cavalier, and he went on and on about their merits. We knew we wanted a small dog, so he could be portable and go to one or the other of our offices. I’m allergic to many short-coated breeds, so that eliminated a lot of contenders. And I really wanted a lapdog, but one who had a little sportiness in him. As to Winston in particular, I myself find it hard to believe, but he was the last unclaimed puppy in the litter. Marsha, awww! I do miss having Winston in the bed, but it got to the point where no one but the dog was getting any sleep. I love waking up in the morning and looking over the side of the bed at him curled up in his bed. And that’s so sweet about the dogs rescuing you. They’re amazing, aren’t they? Tom, I do believe that you and Winston would probably have an excellent time together, but what on earth would the Critter say to such treachery on your part? You might come home to find some unpleasant surprises waiting around the house. Oh, Eileen! I skipped you. I think we Christopher Guest fans should start putting that into everyday rotation. No one else would laugh, but we would all know each other. It’s a deal, Kristina! We can push this trend into existence! And then we’ll be sooooo cool. I’m remarkably firm with human children–comes from my years as a babysitter/big sister. But I never had a dog to spoil, so Winston is special. You’re far from tupid! But I discovered tonight that Winston is indeed tinky. How does it happen so fast?